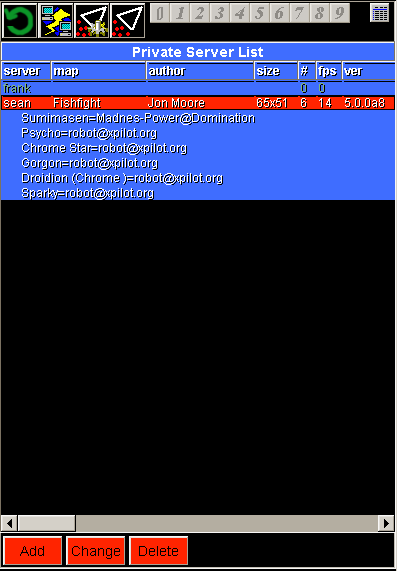 sean has 1 human and 5 robot players. This window is your gateway to playing XPilot on servers behind the same firewall as you. Refresh the list. Any new servers or players are added to the list. Similarly, players and servers leaving are removed. Measure the lag between you and each server. Administer a remote server. If a server is greater than version 5.0 then this button is enabled. If you know the server's password then you can enter it in the ServerGui tool and change the settings of that server. Launch the client and join a game on a server. ... Team join buttons are currently not functional in PrivateServer. You can change which columns are displayed in the list. Add a new server to the list. You can use either a host name (i.e. sean or sean.buckosoft.com) or an IP address (i.e. 10.10.20.2). Change an existing server in the list.